New TP-S30 thermal interface pads from MH&W International provide 3.0 W/mK of thermal conductivity between hot components and heat sinks at lower costs than competing gap filler materials. Pads of TP-S30 thermal gap fillers are soft and compliant for easy compression and filling of air gaps between mounting surfaces to optimize heat transfer. Applications for these gap fillers include alternative energy, consumer electronics, telecommunications, power supplies, flat panel displays, and portable electronics. Pricing for standard TP- S30 gap filler material starts at $0.07 (0.5 mm thick) per square inch. 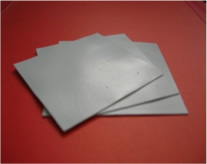 Lower pricing is available for TP-S materials with lower thermal conductivities, i.e. 2.0 and 1.0 W/mK (TP-S20 and TP-S10). A low silicone content version, TP-S30LS, has less than 50 parts per million silicone content for applications where silicone-based outgassing can lead to contamination problems or oily silicone residues can hamper assembly. All TP-S series gap fillers are provided in 210 x 297 mm (8.3 x 11.7 inch) sheets or in standard die cut shapes. Custom shapes are available. Standard materials have a Shore 00 hardness of 45. Standard thicknesses range from 0.5 to 5.0 mm. All materials are UL94 V0 rated and have a use temperature range of -60° to +200° C.